FILE - A money changer counts Turkish lira at an currency exchange office in Istanbul, Aug. 21, 2015. The Turkish lira Tuesday hit another historic low against the U.S. dollar amid growing financial market concerns that the Turkish economy is overheating. With elections on the horizon, the government is stoking economic growth. The latest figures saw growth running at over 7 percent, making Turkey one of the fastest-growing economies in the developed world. But international investors are becoming increasingly alarmed at the cost of such growth, with double-digit inflation and a surge in imports widening Turkey's current account deficit (the difference between imports and exports). "Investors are disappointed by the fact the government is pushing growth even faster, rather than addressing the imbalances that show up, such as high inflation and wide current account deficit." said economist Inan Demir of Nomura banking. "Some people say this: 'Too much growth is not a good thing,' " Turkish President Recep Tayyip Erdogan said in a speech Monday aimed at challenging financial critics. "Why? Because they are jealous. It is nothing else." In another move aimed at defying critics, Erdogan also announced a new $34 billion economic stimulus package. Much of Turkey's rapid growth has been achieved by the government injecting billions of dollars into the economy. Erdogan further challenged international markets by renewing his strong opposition to increasing interest rates, which orthodox economic theory demands to protect a falling currency. "If there isn't an increase in interest rates, the likelihood will be the lira will continue to depreciate," warned Demir. "More or less, the lira will remain at the mercy of global sentiment. It's extremely difficult to draw a line where the depreciation stops on its own." Since the start of the year, the lira has fallen over 7 percent against the dollar. FILE - Turkish Deputy Prime Minister Mehmet Simsek is pictured in Ankara, Dec. 23, 2015. Last week, the lira fell heavily amid reports that Deputy Prime Minister Mehmet Simsek had resigned after a heated telephone conversation with Erdogan over interest rate policy. Analysts suggest that Simsek, who is responsible for the economy, is key to maintaining the confidence of financial markets in Turkey, having formerly worked for international investment bank Goldman Sachs. According to Ankara sources, Simsek withdrew his resignation only after intense government pressure. But with presidential and general elections upcoming in 2019, a booming economy is seen as key to Erdogan and his ruling AKP Party's re-election chances. "He [Erdogan] knows the way to win the election is by improving the economic situation," wrote newspaper columnist and presidential insider Abdulkadir Selvi in Monday's Hurriyet. "That is why he declared 2018 as the year of performance, growth and employment." Analyst Atilla Yesilada of Global Source Partners asked, "What is left with AKP's vision? Ten years ago, it was a big-tent party. It talked about human rights, modern democracy advancement, a humane society. Now, there is only mega-construction projects left and economic growth. So, if they stop stimulating the economy, economic growth will immediately fall off the cliff, and they will have no chance to win in a fair election." But a plummeting currency brings its own economic risks. Experts warn that heavy currency decreases usually undermine consumer confidence, leading invariably to a fall in consumption, and ultimately hitting growth. A more imminent threat faced by Turkey is debt. 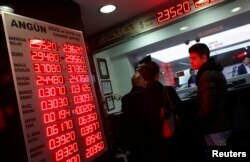 Turkish companies' short-term foreign exchange debt stands at $220 billion. "We hear more and more companies requesting loan restructuring from the banks," Demir said. "In the coming days as the lira depreciates further, more and more companies will find it more difficult to meet their foreign currency obligations with an overwhelming Turkish cash flow." FILE - People check currency exchange rates at an exchange office in Istanbul, Dec. 16, 2014. In the past few weeks, two of Turkey's largest companies have sought to restructure nearly $12 billion in bank loans. Turkish banks are now facing increasing scrutiny over their corporate loan exposure and how many of their loans are still performing. "Clearly there is an understanding between [Turkey's] regulatory authorities, the banks and major companies that the system must go on," Yesilada said. "It's in nobody's interest to declare these loans nonperforming or the borrowers bankrupt, so everything looks good. But nothing is being sustained, to be perfectly honest." Turkish banking stocks have fallen heavily in the past few months and are now trading at nine-year lows. Most analysts claim, despite growing financial pressures, that the integrity of the banking system still remains strong. But the same analysts warn that banks may curtail future lending, which would likely affect growth. Demir predicts Erdogan and his government's dash for growth could ultimately become self-defeating. "If the insistence on pro-growth measures continues, and investors become more and more concerned about the external financing requirements and sell liras, the pro-growth measures may actually turn out to be counterproductive, because the weaker lira could hurt company balance sheets, forcing more of them to seek a restructuring of their loans, and forcing them to cut back on investment and generating new employment," Demir said.